The Israeli Foreign Ministry lashed out against the move, saying, “The State of Israel views the parliament’s decision with severity, in particular the call for labeling products. 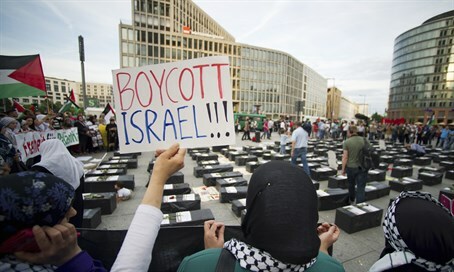 The process of labeling is discriminatory, and reeks of a boycott." Foreign Ministry spokesman Emmanuel Nahshon said that the EU motion was "discriminatory with a sharp smell of boycott," adding that "under the guise of a technical procedure, this is an attempt to force a diplomatic solution instead of encouraging the Palestinians to return to the negotiating table." He added: "Europe treats Israel with sanctimonious hypocrisy, while it doesn’t raise the issue of similar solutions in Northern Cyprus and Western Sahara." Deputy Foreign Minister Tzipi Hotovely responded to the decision by saying: “We need to call a spade a spade: marking products is a boycott. Hotovely said that immediately after Rosh Hashana, she intends to hold an urgent session on the matter with the Europe Section of the ministry, and launch a diplomatic campaign against the EU initiative to label products.